Locality: United States, New York, Bronx, United States: New York: Bronx County. In cultivation, New York Botanical Garden, Bronx Park, Bronx Co., New York City, N.Y.
Notes: [Voucher ann. :] Cited specimen! Deposited for permanent record. --[Commentary ann. 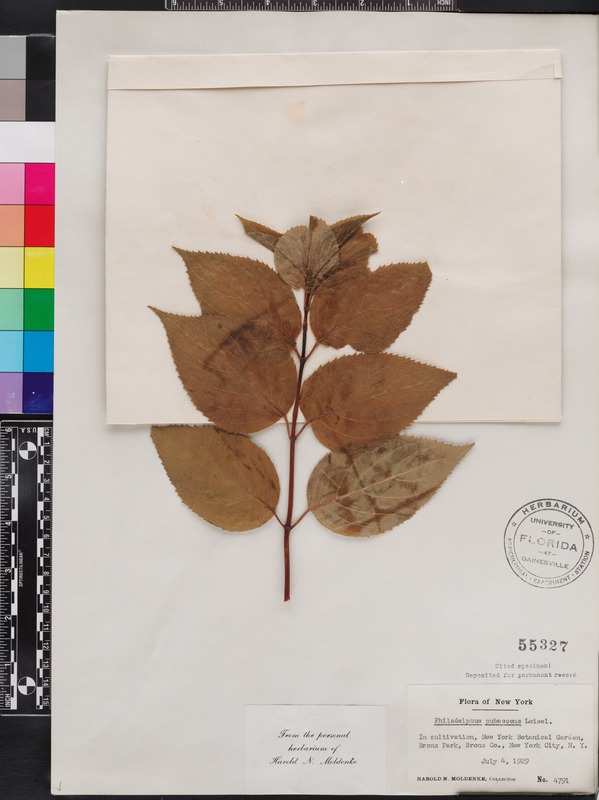 :] From the personal herbarium of Harold N. Moldenke. --[Admin. note:] Sent for a treatment of Philadelphus for Flora of North America by Dr. Alan Weakley and Ms. Allison Weakley, FLAS loan 2006-13, 27 Jun 2006. Specimen returned unannotated, 25 Apr 2015.